From the clay tablets of the Minoans to the papyrus scrolls of the Egyptians, from the illuminated manuscripts of medieval monasteries to Gutenberg’s Bible and the pulp novels of the 20th century, the book has had a monumental role in the creation of civilization. It is history itself. Because of this historical and cultural context, the book offers a wealth of possibilities to the artist. As an alternative formal medium it allows for an abundance of inherent associations and semiotic play. 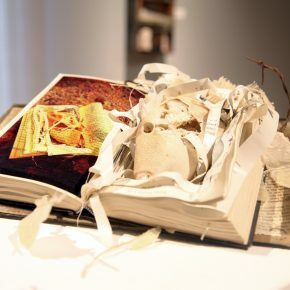 This is in evidence at Altared Books: Offerings in (Con)text, now at Finch Lane Gallery, where seven artists deconstruct the book in various ways and methods to various ends, using fragments, not of history, but the avatar of this history, the book itself. Yet, despite the transformations these objects undergo, ultimately they retain part of their original purpose, the power of narrative. Exhibition curator Kandace Steadman says the show and its title refer to “books that are not just changed but given as an offering, a sacrifice, not necessarily religious, but like an altar, a place of devotion.” That devotion is a recontextualizing of contexts, to ascribe new meaning from the wealth of meaning available to the artist from the source material that is a book, and creating an entirely new narrative through altered contexts. 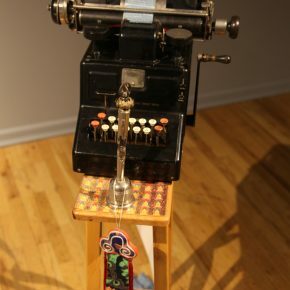 Carol Berrey’s “Altered Altar” is an excellent introduction to the show. It is a literal triptych altarpiece complete with the triptych panel paintings, candles, table, scriptures, and even a holy icon. All elements have been produced by the use of appropriated pages of scripture from various Christian texts in various languages. 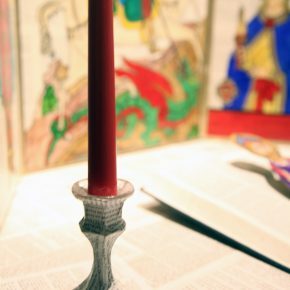 These texts cover the entire work, including the candlesticks. 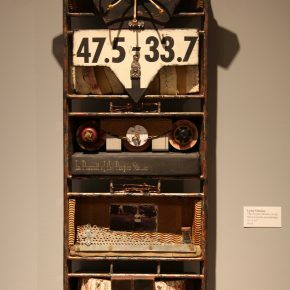 Berrey makes literal the thesis of the show by placing in recontextualized form a book as an altar, and in doing so, acknowledges the seminal history of the book, representative of the core of universalized religion, in the history of Western civilization. Here, the reality of the essential thread of history being maintained “at the altar,” in its darkest moments, its most uncivilized hour, is alluded to, and the parallel of the civilization of humanity, and the prominence of the book, is made manifest. 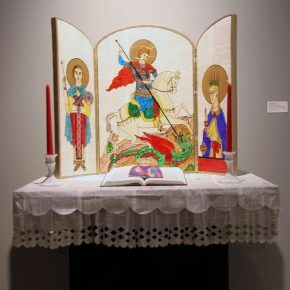 Berrey sees her work as a unification of many types of Western religions and looks to the future in her work as she states, “By combining these sacred materials from many religions, I express my hope for a future free from religious strife.” Like the book, the art’s narrative invites liberal interpretation. 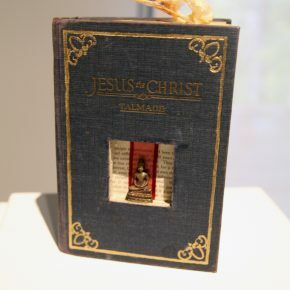 A more particular allusion to the book and its specificity as a medium in religious propagation is made the subject of a work of art by Chauncey Secrist with his altered book “The Sacred and Profane.” Always begging the questions but forever leaving an open door, the work is an inquisition into universalized religion and its relevancy today. The book that has been altered retains its original context while the allowance for play that it might at the same time be altared, and its original context be bent and made malleable. The book is an older, hardback version of Jesus the Christ, written by Mormon apostle James Talmage and held in high esteem by the LDS faith. Within the book has been cut a tabernacle for a small bronze Buddha, a symbol that much of the Eastern Hemisphere holds as sacred. On top of this devotional offering is a long beaked bird’s skull placed along the top edge of the book. “Just how relevant, how alive in today’s culture, in contemporary reality, is this thinking from the distant past?” Secrist seems to be asking. This kind of narrative recontextualization is heightened in three pieces by Frank McEntire. 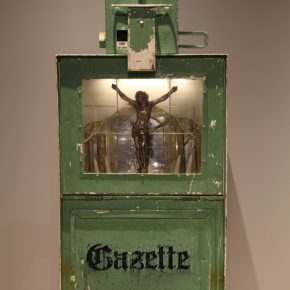 With “Gazette” and “Scripture Writer Reconfigured,” the most elaborate alterations in the show with the most found-object appropriation and the least book, McEntire is begging no questions and leaves no doors open with his satire on the dominance of religion. In “Illustrated Scripture History,” he addresses the subject with some brevity… even subtlety. 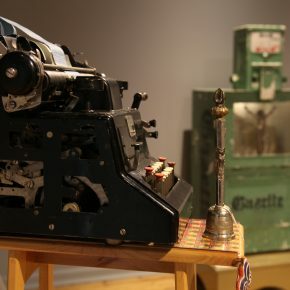 Although more reductive in form than the typing machine and prayer role of “Scripture Writer Reconfigured” or the antique newspaper vending machine in “Gazette,” “Illustrated Scripture History” might even be said to have a formal elegance but in all actuality it is violent and angry. 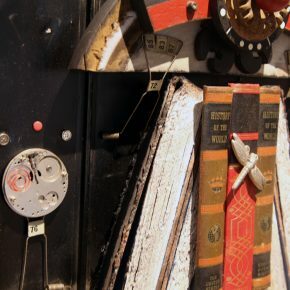 A train rail spike has been driven through a small antique volume, the title of the piece, that sits squared on top of two consecutively larger antique volumes. The narrative is a straightforward and direct statement on religion, spelled out through so many elements, the book being one essential symbol to convey this message, be it through a series of symbols in “Gazette,” with a silver crucifix in the facing panel, a miniature Salt Lake Temple with phallic-like rockets all set on an LDS sacrament tray set on a large volume of scripture, or the simplified ““Illustrated Scripture History.” Either way, each tells a story. The work of Jody Plant addresses her audience on an entirely different level, or levels. Her altered creations impact the viewer in a way that is the antithesis of McEntire’s nail on the hammer method, but merely a suggestion, a devotion of elements that are as if they had never been anything than what they are, that their altered state is their true state, that this is their genuine state of being, and in this genuine state of being their purpose, like each of the works we have seen thus far, through a vocabulary of symbols, speaks a narrative, not one in particular, but custom made for each individual viewer’s sensible responsive state of being. It is a harmonic synthesis. “Heretic” makes an inward protestation and is not loud but allows its viewer to ponder it and opens itself to be considered. Like a Rothko in sculpted multimedia form, it is an object of contemplation, of “natural or forgotten worlds,” says Plant. 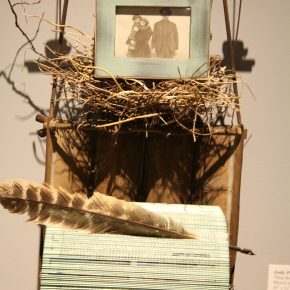 Plant makes a feathery display of the book at top with folded paper, and sets that on an old piece of driftwood like a boat, which rests on a bird’s nest. 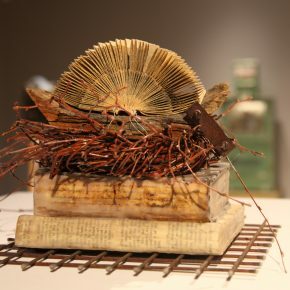 This Plant sets on two books shelled in encaustic and placed on a grating. It is a series of symbols whose vocabulary can be read in any manner the viewer likes, adhering to the theme of nature, and stories and mystery. It is not a puzzle but possibility for inspiration and sensible stimulation and wonderment. “They Became Birds” is likewise a devotion of possibility for thought and feeling. The book, again, has been feathered, and in it Plant has placed a feather, as if it were always meant to be there. Set on a rusted hanging frame, there is a nest and a small frame with an antique photograph. Here the notion of time sets in to propel the concourse of inspiration and direct the narrative and it is one that moves us “not only in three, but in four dimensions,” says Plant. This is seen lucidly in her “La Perouse Bay,” where the open book is in a state of destruction and within it is placed a decayed hull of a fish. All has been ravaged by time and what is left are fragments of a reality the viewer must piece together, come to grips with, or make some sense out of with total liberty and no occupying force to determine responsiveness. Artist Loné Vilnius’ “Book Wise” is a pun loosely structured on a re-created owl formed out of a restructured book, drawing on not only the formal allowances of the book she creates in a semi-owl-like structure, but also the relationship between the knowledge contained in a book and the allusion to the wise owl. In this and works like “The Proper Sinner” and “The Written Word” Vilnius creates an art for arts’ sake discourse with her altered books creations. She deconstructs the formal aspects of the book and recontextualizes them in new, structurally surprising, humorous, whimsical or challenging ways, in a context similar to Modernist formalist experimentation, pushing the limitations of just what artistic ends can be reached with the book with work that deconstructs and recontextualizes the book purely for its own sake. Nancy Steele-Makasci uses the book to relate specific historically relevant narrative episodes. 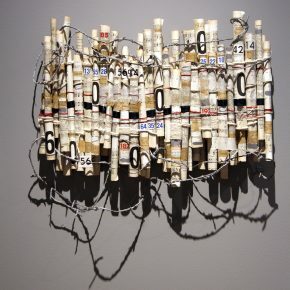 In “6,000,000” the artist uses a signature paper fluting layered with collaged paper to recall the historical occurrence of the Holocaust, made poignant by the handmade and painted barbed wire that surrounds the paper fluting. In “Shrine: Worship! DO NOT READ!” the viewer is reminded of Catholic Church history and the strictly enforced illiteracy upon the general population of Europe whose only means to knowledge was through Church-commissioned art. 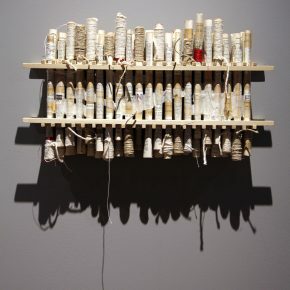 And in “Ephemeral Flute,” the artist’s altared book tubing is wound with cord to re-create the temporal passage of time and the reality of the ceaseless narrative that is the essence and reality of time. 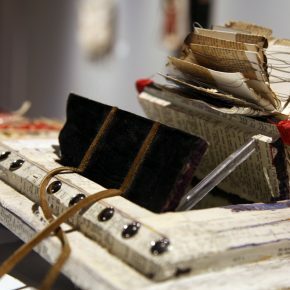 Emily Dyer is the only artist in the show who, rather than altering or recontextualizing a book, has rendered her own new bookish creation. 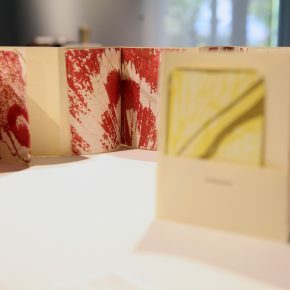 “Extravagant or Credo” is a fold-out accordion-like paper-made book, using words, passages of scripture and poetry, with pockets and pull-out cards, to create an endless play of semantic structures and relationships of meanings of significance — an endless abstract but very poignant narrative. “The book is my explanation of the extravagance of faith—of worship,” says Dyer. “Extravagant or Credo” is an ingenuous formation on the book that, as we have seen, can come in any form or structure, but Dyer stresses the fundamental principle of the book, which is not the turning of the page, but the transporting of information, which, for Dyer’s purposes, is indefatigable. As all artists have made clear, the book is an ephemeron, one that we as the human race have made real and given context. 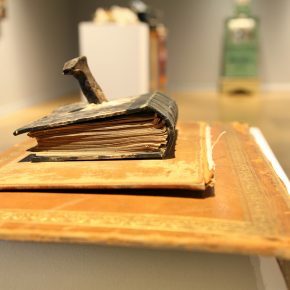 This thoughtful exhibition, in its many altared states, seeks to deconstruct the object of the book, showing that it is not the book that is the substance of religion, civilization, and the passage of time, but we, the civilization that empowers pulp and ink with narrative power. What we find is that the essential quality of the book, its ability to record, to tell a story is still preserved in each of these various artworks. 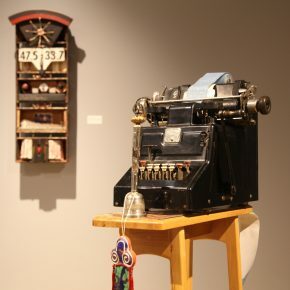 Altared Books: Offerings in (Con) text, featuring the work of Carol Berrey, Emily Dyer, Frank McEntire, Jody Plant, Chauncey Secrist, Nancy Steele-Makasci, and Loné Vilnius, is on exhibit at Salt Lake City’s Finch Lane Galleythrough November 21.